Swellendam is an amazingly central place. It is a much under-publicised fact that we are always about an hour & a bit from anything that you could want. Really – try it. Brandy, Karoo, whales, wine, and so on… And of course, Swellendam is equally central to some impressive landmarks, and few are as significant as the very tip of our great continent. 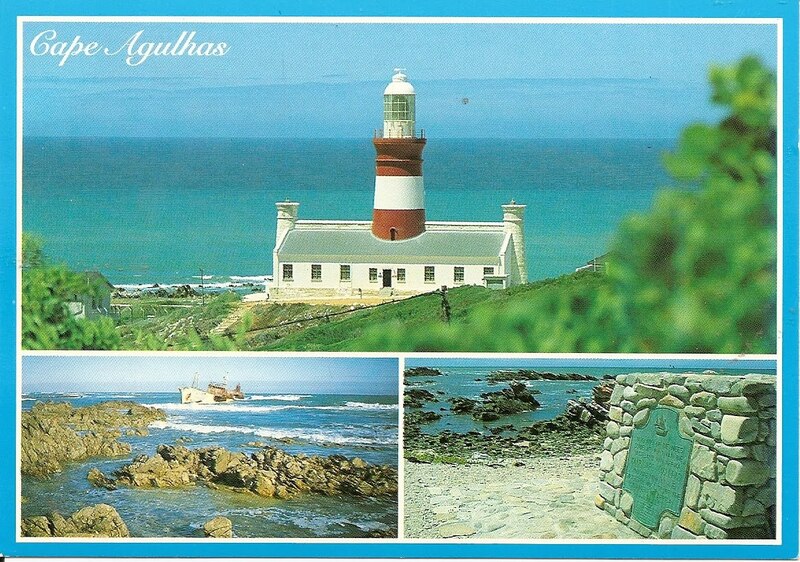 Cape Agulhas, the very most southerly point on the African continent, was given its name by the Portuguese explorer and navigator Bartholomeu Diaz, as he rounded the Cape for the first time in 1488. At Cabo L’Agulhas Diaz and subsequent explorers discovered that their compass needles swung in various directions. Diaz found that at the Cape of Needles magnetic and true north coincided (i.e., no magnetic declination). The coastline in the Agulhas region is treacherous and fringed with dangerous reefs on which more ships have been wrecked than any other part of the South African coastline. The necessity for a navigational light at this cape was absolutely essential and was given consideration by Colonel C.C. Michell, the surveyor-general at the Cape, in 1837. In order to avert further shipping disasters a request for a light was brought to the attention of Governor Sir Benjamin D’Urban. ……nature has, it would seem, provided an isolated hill, the height of which above the sea is about 270 foot at the extreme end of the promontory …..the hill is some mass of excellent limestone. Easily quarried and dressed ….thus obviating the expense of transport of stones and bricks. It was recognised that the Hon. Michel van Breda owned the ground and was willing to contribute by giving in perpetuity, as much ground as was required for the lighthouse. Michell remarked that he was astonished and aggrieved to hear about objections to the proposed lighthouse. The feeling was that captains of vessels ought to be well acquainted with their duty and too vigilant to need a light. 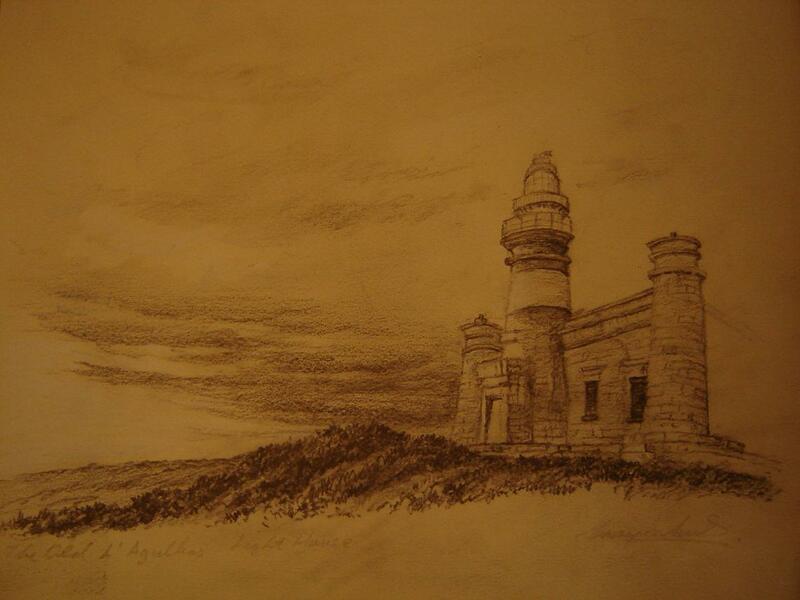 A public meeting to discuss the erection of the Agulhas light was held at the Commercial Exchange in July 1840. The Hon. W Porler, Financial Secretary of the Cape and chairman of the meeting, let the anti-lighthouse lobby group ‘have it’ in no uncertain terms. “Lighthouses, it is conceived, are vulgar, old fashioned affairs, the clumsy, but convenient mode of other time that counteract ignorance, and fit enough perhaps, even now, to show small craft the way of creeping around the coast, and objects of derision to superior seamanship which, in the present day conducts the eastern trade… Now if you tell me that a beacon on L’Agulhas is unnecessary, then I say – put out the Channel lights, why waste the precious oil? If seamen should require no aid of that description, darken every lighthouse in existence, you may do so with safety”. The legislative council of the Cape met in September 1847 to consider estimates for the following year and up for approval were the L’Agulhas and Recife lighthouses. The total cost for building the two lights was estimated at £25 000, of which the Legislature would forward half. A further £1 600 was received from private subscription. At long last progress could be reported! 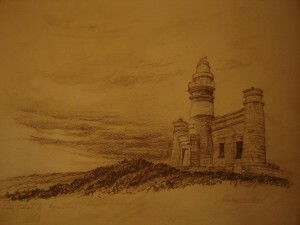 Col. Michell, on a visit to England in 1847, made arrangements for the equipment for the Agulhas and Recife lighthouses. It is not quite certain when the building of the tower commenced. Some letters of the time, dated 8 January 1848, make reference to the completion of the ‘foundation block’. 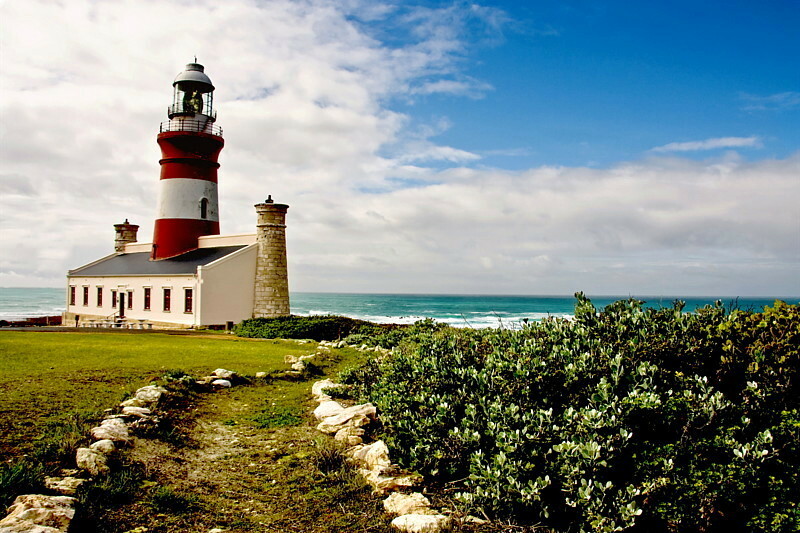 A notice issued by the secretary on 15 December 1848 indicated that the Agulhas lighthouse had been recently completed and that the light would be lit on 1 March 1849. This notice was followed by a comprehensive guide to ‘General Sailing’ complied by T. Maclear, the Astronomer Royal at the Cape. It is clear from these instructions that navigating around Agulhas was no easy exercise in those times. Maclear gave precise distances that needed to be observed to avoid running aground on the South African coast. New incandescent burners with 85mm mantles installed. Lighted at 7.45 p.m. Burners worked excellently all night, giving no trouble. The increase in beam intensity from 4 500 to 10 000 cd has a marked effect on the neighbouring veld, which now becomes brilliantly illuminated. During the night an intrepid beetle visited the lighthouse and flying straight into the mantle to an untimely death by cremation without even leaving his ashes as a memento. A gauze is being fitted to the ventilator to warn similar adventurers. The next modification took place in February 1906 when the burners were altered to consume white rose oil. The installation of the new incandescent burner was the only change made to the lighthouse in over fifty years of operation. During this period, however, the debate raged on concerning the site location and in 1906 the recommendation for an improved lighthouse was accepted. The proposal , by H.C. Cooper, made provision for a new tower of reinforced concrete. The tower was designed to render enhanced beam elevation (180 ft to the focal plane). Financial constraints prevented the full implementation of the scheme which included the provision of a first-order flashing light. Mr Cooper commenced work on the installation of the new optical apparatus in February 1910. He dismantled the original optic and installed the new with the assistance of the lightkeeper, his assistant, two relieving lightkeepers and a handful of labourers. The task was extremely difficult as all the castings and glass lens panels were heavy and awkward. One piece weighed 27 cats. Five years later Cooper returned to Agulhas to install the new lantern. It took him less than a month to complete the task of replacing the original lantern, with flat glazing, with the new circular lantern with curved glazing. The new light was exhibited on 1 February 1915. The two projects, however, should have been run simultaneously. The financial position at the time dictated otherwise. Other enhancements over the years have been; the installation of the Chance Bros. petroleum vapour burner in 1921 and in 1935 the addition of a diesel generator and radio beacon. By 1949 Cape Agulhas had served shipping around the southern tip of Africa for a century. The SA railways Administration marked the occasion with a ceremony at the lighthouse ‘to rekindle the light’ for another hundred years. Captain MacAllen of the Edinburgh Castle pressed a button to open the curtain in the lantern. It swung open, the light switched on and the heavy lens started rotating. 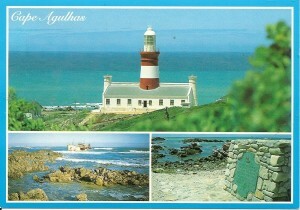 Agulhas was ready to serve for another hundred years. In 1962, however, the tower was deemed to be unsafe because of the seriously decomposing limestone. A new lighthouse comprising a twelve metre aluminium tower, a new 300 mm focal length revolving optic and 1,5 kW electric lamp was commissioned on 20 February 1968. The light produces a white flash every five seconds and has a range of thirty sea miles. The original lighthouse which was declared a national monument was recommissioned on 25 March 1988 after being restored. Today the lighthouse building also serves as a museum.